Determined or Happy…hmmm…which one is more laughable? I keep seeing commercials for these ridiculous things. I believe this is bordering on insulting and I’m not even a fan of Obama. How hilarious-a plant grows out of his head to create a green afro. One of the first things Obama should have done when he took office is ban this product that so very unflatteringly bears his likeness. Do any of you agree with me? It really is laughable, and the commercial trys to make it out to be so dignified and commemorative. I seriously could pee in my pants laughing everytime I see this advertisment on TV. If you disagree with me, or just what to own one, go here to get yours. Don’t tell them I sent you. Ok. I’m sitting here depressed and then I see this thing. OMG in heaven! That is far worse than the average insult. ROFLMAO! That would be embarassing to own – to admit you spent money on it. And if you actually did get one, where do you display it? Crazy! that is by far one of the stupidest things i’ve ever seen. but it is funny – and made me chuckle! OMG I haven’t seen that!! Its pretty funny and I have just the person to buy one for as a gag gift. Really? Is this real?! I’m sorry, but it made me LAUGH and I needed as many laughs as I can get today. hahahaha!!!!!! The prez dude deserves it! It’s just part of the job! 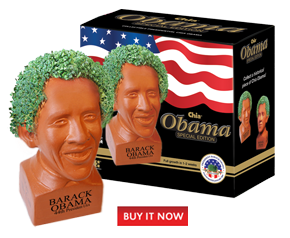 I remember there used to be a chia-likeness for Clinton. I got my DH a Clinton “bust” made our of zoo poop for our front flowerbed one year for his birthday. Yeah, Clinton was a poop head! LOL!